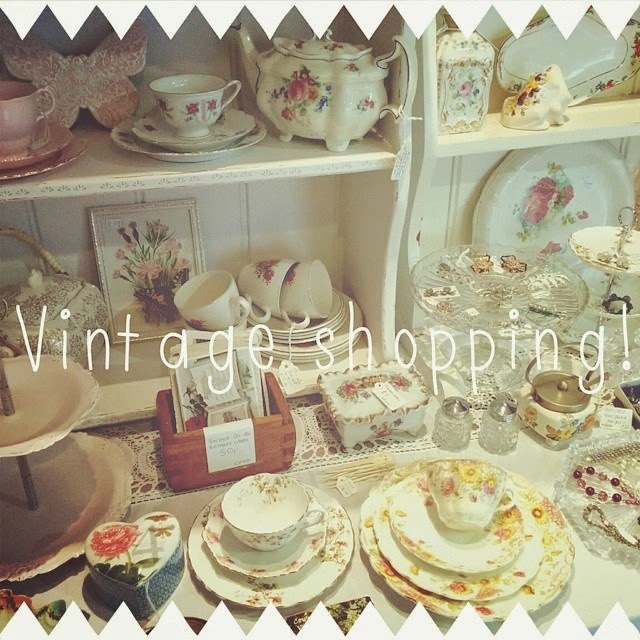 August has been a month for hunting for vintage treasures. Last month, having followed the Channel 4 programme This Old Thing, where presenter Dawn O'Porter encouraged viewers to forgo the mass produced high street buys in favour of original vintage finds, I made a rule for myself that I wouldn't buy anymore brand new clothes for the rest of the year ( blog post on this coming soon) and instead I would seek out more vintage finds. 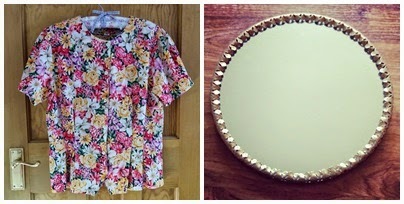 So this month I bought this great vintage top from a vintage shop in Brick Lane and (applying my new rule to home ware shopping too!) also a mirror with a pretty metal frame that I'm probably going to spray paint. 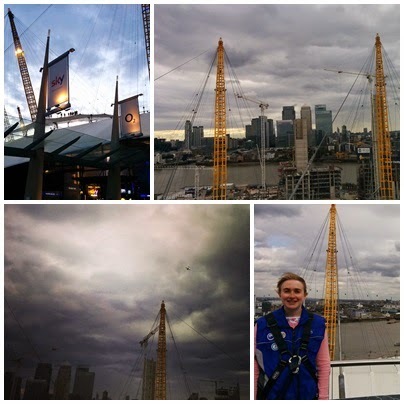 On a very Autumnal feeling August day, a good friend and I climbed the 52 metres onto the roof of the o2! 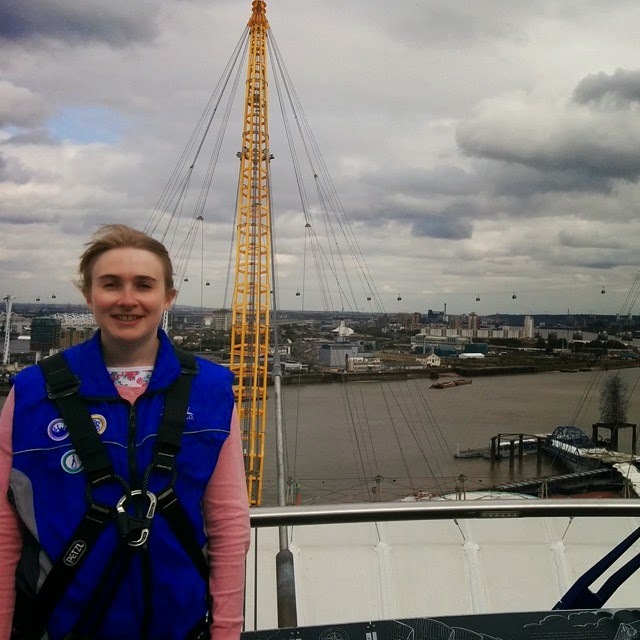 There are great panoramic views up there and it was something fun and different to try, I'd definitely recommend it! I'm currently running a giveaway on Instagram to win one of my handmade knitted brooches. If you'd like to enter, head on over to my Instagram page to find out more! 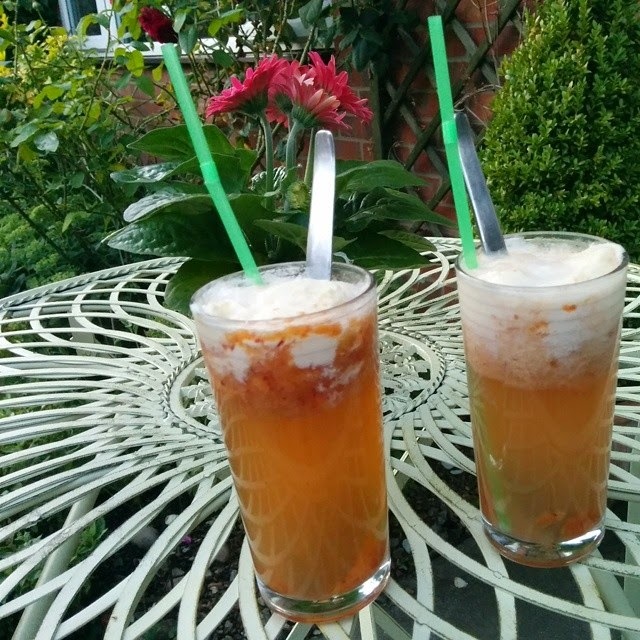 I hope you've all had a good August, what did you get up to? Instagram giveaway! 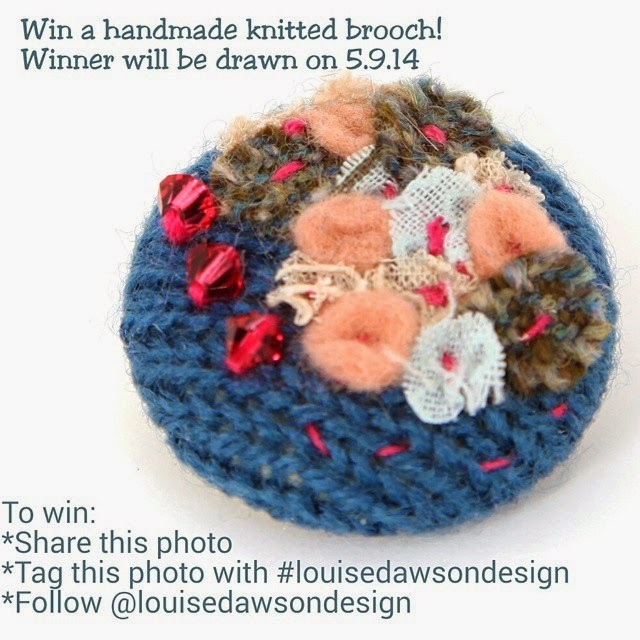 Win a Louise Dawson Design Handmade Knitted Brooch! 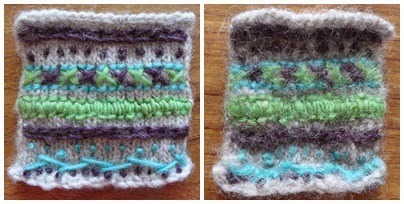 Over on Instagram at the moment I'm having a giveaway to win one of my handmade knitted brooches! I'd love for you to enter, hop on over to Instagram and check it out- good luck! I've very kindly been given a huge bundle of fabric samples, so I've sorted through them all and there are some really pretty pieces! I've made a little dent in my new stash today, learning to make some teeny-tiny fabric Yo-Yos using a Clover Quick Yo-Yo Maker. I haven't made Yo-Yos before but I think it could get quite addictive, especially as you can buy the tools in different sizes! I think they look like little rosettes! 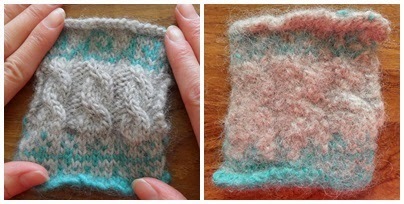 They are so quick and easy to make and they show off the colours of the fabric really well- I'm excited to see what I can make with them. I've made a Fabric Yo-Yos Pinterest board for inspiration! I'm just experimenting at the moment, still working towards a new textile jewellery collection, but I think the Yo-Yos look quite sweet added to the Harris Tweed, which I've begun to embroider with Bullion Knot flowers. You may remember from this post that I wanted to make my way through the Tilly and The Buttons book Love At First Stitch, so now I've moved on to the second project, the Margot Pyjamas! I traced off the pattern and I have actually cut the pieces out now- I'm quite slow and a novice when it comes to making things like this but I'm glad I've made a good start! The step by step instructions are so useful and I'm looking forward to cracking on with these. Using food tips as weights, such a handy tip from the book! Looking forward to getting these made and wearing them. I might make a heavier weight pair for the winter too! A while ago I took up hoola-hooping in an attempt to bring some excercise into my life, but I didn't stick to it, so this week I've made the effort to get outside and hoop every morning with my ipod, and do sit-ups too. I'm really feeling it after a week of excercise! I'm hoping that by doing it every day I'll establish it as part of my routine and I also hope that by sharing this goal with you I'll be more likely to stick with it. It's actually really fun if you've got some good bouncy music on too! In contrast to the exercise, I made a Blackberry and Marshmallow cake (you've got to have some treats!) and gave a vintage metal tray an update in a How To..! I recently posted a How To... featuring fabric wrapped bangles and I've really caught the bug for making these, so I went charity shop hunting for bangles to cover with recycled fabrics, beads and chain- I'll be adding a selection to my Etsy shop soon! I picked up a second hand copy of Danny Wallace's "Yes Man" which I'm enjoying and hoping to learn from! I hope you've all had a lovely week and have a happy Bank Holiday weekend. Share what you get up to in the comments! It's the time of year when Blackberries are coming into season and you see them growing in abundance in the hedgerows. I'd been thinking for a while that I'd like to come up with some new recipes using Blackberries this year and whilst watching Dragons Den one evening there was a pitch for Marshmallows (love love love marshmallows!) and this started the cogs turning! The Great British Bake Off is also back and making me hungry on Wednesday nights, so the natural choice was to make a cake. So this is what I conjured up, a Blackberry and Marshmallow cake! I've kept the sugar in the filling to a minimum as I didn't want it to be a sugary overload and I hope you'll agree it's just right! Enjoy! 10) Add the top half of your cake and dust lightly with icing sugar. Enjoy! Have you come up with any inventive recipes using Blackberries? Post them in the comments below! Happy making! Today I'm sharing a really quick and simple How To... using the metal trays you often find in charity shops. I spotted this one whilst charity shop thrifting recently and knew it would be perfect to use to serve drinks or for tea in the garden, but I wanted to give it a bit of a modern makeover. So... I gave it a colourful transformation with spray paint! Here's the How To..! It's as simple as that, one old fashioned tray transformed into a stylish and colourful way to serve your tea, cakes and drinks! I love how the spray paint highlights the edging details around the tray and you can find these trays in all sorts of shapes and sizes so you could spray them all different colours! Tomorrow I'll be sharing the recipe for my Blackberry and Marshmallow cake, perfect for serving on your lovely colourful tray! The Cornershop- a whole shop filled with groceries made of felt! 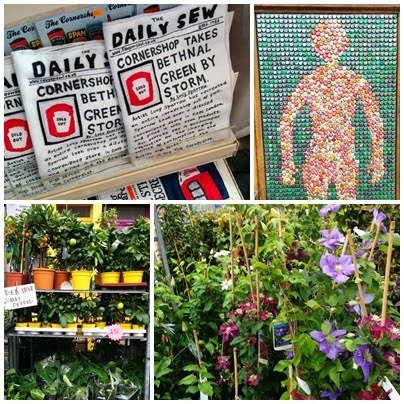 This weekend I was lucky enough to visit The Cornershop, a former derelict shop in Bethnal Green, London, which artist Lucy Sparrow has completely filled with everyday grocery items, all hand made in felt! Such a fun idea! The shop contains over 4,000 felt versions of everything you can think of that you can find in a grocery store, ranging from newspapers, tins of beans, packets of biscuits, chocolate bars and frozen chips! It's just like walking into your local corner shop, except the stock isn't edible and is much more cuddly! Such is Lucy's dedication to her theme, even the till is made of felt and Lucy stood behind her counter (in front of the felted tobacco kiosk!) making more felt groceries. 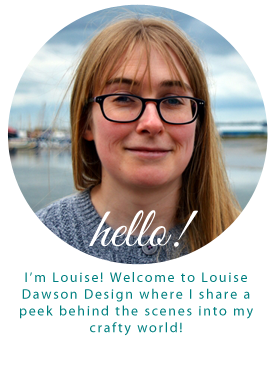 The whole project took Lucy 7 months to complete and Lucy's aim is to engage the local community within accessible art and through sewing workshops. Guilt free Chocolate Digestives! No calories! Read all about it! In felt! The shop in Bethnal Green will be open until the end of August, before moving on to Brighton in October. Find out more and how to get there here! I thoroughly recommend a visit to admire the craftsmanship that's gone into the project and perhaps even buy your very own felt can of beans! Grocery shopping doesn't get more fun than this! I had some neglected plastic bangles in my jewellery box that I hadn't worn for ages, so I decided to give them a makeover! This is a really simple How To... but I think you'll agree, the bangles you create are very pretty and it's a very thrifty make too. How about recycling the pretty fabric from an old top to make a matching set of bangles and adding beads from the broken necklace that you love but you know you'll never get fixed? Oooh and they also make great gifts! 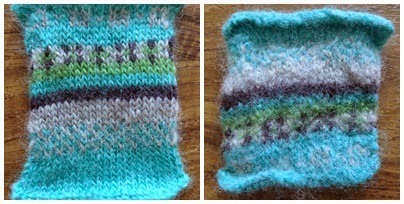 Here is a tutorial for making the basic recycled fabric wrapped bangles and a couple of variations- happy making! Add a small amount of PVA glue to the inside of your bangle and add the end of your first fabric strip. It's much easier (and less messy!) to only add glue to the inside of the bangle, rather than gluing the fabric! It's as simple as that to transform a boring unused bangle into something pretty. You could leave your bangle plain like this, or read on for further ideas! Enjoy wearing your lovely updated bangles!